Rediff.com » News » Can the niece claim Amma's legacy? There is no denying that the Deepa identity has overnight caught the people’s imagination across the state. But converting that into an imagery and from there as support and vote-base is a different matter altogether, says N Sathiya Moorthy. Image: The late Jayalalithaa’s niece Deepa Jayakumar launches her new party MGR Amma Deepa Peravai in Chennai on February 24, 2017. Photograph: R Senthil Kumar/PTI Photo. 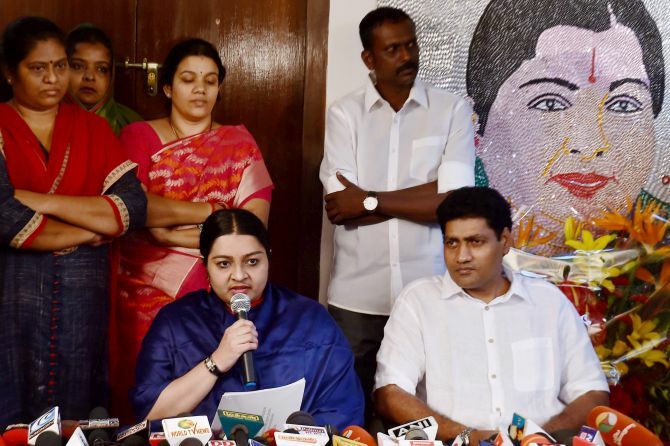 Now that J Deepa, niece of the ruling All India Anna Dravida Munnetra Kazhagam supremo and Tamil Nadu chief minister, the late Jayalalithaa, has floated a new political outfit, the question arises as to where her support base would come from. An accompanying question is if the ‘visible enthusiasm’ for her, as evidenced outsider her residence in Chennai would all turn into votes in her favour -- and, would it be enough to catapult a political novice anywhere close to the seat of power in what still remains a ‘Dravidian stronghold’. Such arguments are not without reason. Despite her claims to represent Jaya’s politics, it’s highly unlikely that time-tested AIADMK cadres would go her way, barring on occasions and for specific reasons. Most of the traditional ‘anti-Establishment’ AIADMK second-line leaders in the districts, opposed to the ‘Sasikala brand’ of party politics and leadership, have already migrated to the rival faction led by three-time former chief minister, O Panneerselvam, or OPS. Even those cadres opposed to V K Sasikala taking over as AIADMK general secretary first, and wanting to become CM not very long after, seem confused. Either they might go the OPS way, or would want to give incumbent CM, Edappadi K Palaniswami, time before deciding on their next step. In between, they had toyed with the idea of backing a third leader like Deepa, as OPS was seen in Sasikala’s company and was also seen as doing her bidding. Not any more, it would seem. After sending out equally confusing signals to the cadres, especially over her decision to go the whole hog with the OPS faction, Deepa announced the launch of her political outfit on Jaya’s first birth anniversary after the latter’s departure. The inexperience, if not immaturity, of her advisory team stands out when one toys with the prospect of coining an acronym for her ‘MGR-Amma Deepa Peravai’, named after AIADMK founder MGR, Tamil Nadu’s one and only ‘Amma’, and her own self. An acronym is essential to popularise the outfit’s name among the cadres and masses, but this one will read ‘MAD Forum’ in English. However, none in Deepa’s inner circle seems to have noticed it. If her opponents have done so, they have not found it worth their while to react to it. In Tamil, for want of headline space and ready trigger in the reader, it could be referred only as ‘Deepa Peravai’, disassociating the title from those of MGR and Jaya that the organisers have very assiduously added on. Suffice to point out that in the absence of a Tamil acronym that could be used constantly in media references, a relatively recent political party like actor-politician Seeman’s ‘Naam Thamizhar Katchi’ is continued to be referred to only by the name of the founder, and not by that of the party. It does not stop there, either. At a time when national politics is rife with criticism of ‘family parties’ and the AIADMK too is faced with ‘family rule’ by Sasikala’s kith and kin, for Deepa to use her own name as a part of her outfit’s name may leave a bad taste in the mouth of prospective cadres and supporters alike. Deepa is not a member of the AIADMK. Traditional cadres opposed to Sasi & Co, and wanting to look beyond OPS for a credible and firm alternative may be touched, if not moved by her use of the names of MGR and Jaya. But they are also the ones who mostly identify with the MGR-Jaya ‘Two Leaves’ election symbol. Deepa’s decision to float a new party, while being a pragmatic move, also implies that she is now looking at capturing the AIADMK and owning up the ‘Two Leaves’ symbol. The lien on both, if at all it came to that, could be on OPS, as things stand -- and not certainly on Deepa. If Deepa were to look at the kind of youthful crowd wanting change and were at the forefront of January’s state-wide Jallikattu protests, for instance, they are the ones that is looking for iconoclasts, not someone wanting to duplicate someone and something else that’s already there and of which they are already tired. There is no denying that the Deepa identity has overnight caught the people’s imagination across the state. But converting that into an imagery and from there as support and vote-base is a different matter altogether. With vast and varied political experience, the MDMK’s Vaiko and PMK’s Ramadoss both have their political and electoral limitations exposed over the past decades. Despite the huge success of Prime Minister Narendra Modi, both before and after the 2014 parliamentary polls, the BJP remains a non-starter in the state, as the 2016 assembly election results show. Despite the strong ideological background and some filmi purchase, Seeman and his NMK are still struggling to make their electoral presence felt. They have not been able to make any difference between victory and defeat to anyone else. The DMDK of actor-politician Vijaykanth is fast losing shape, after losing a substantial vote-base, thanks to the over-arching ambitions of its leadership -- unsupported by any real-time political calculations. 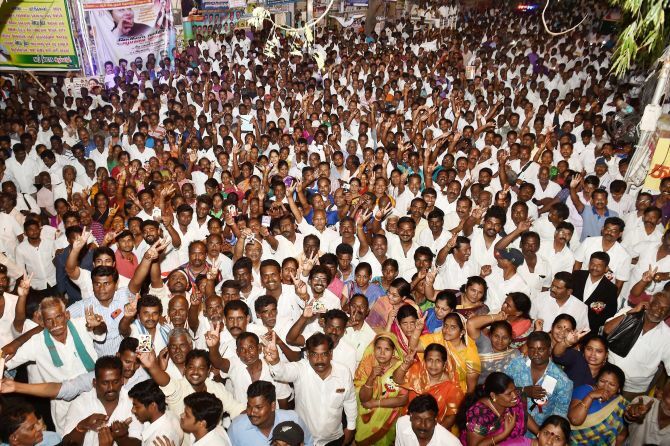 Image: Supporters of the late Jayalalithaa’s niece Deepa Jayakumar at the launch of her new party MGR Amma Deepa Peravai in Chennai on February 24, 2017. Photograph: R Senthil Kumar/PTI Photo. Less said about the state of the Congress, the two communist parties and sub-regional caste-based parties like the VCK and PT in Tamil Nadu, the better it’s for Team Deepa strategists, if there is anyone. Yet, the DMDK experience of Vijaykanth would recall how his vote-base went up to 10 per cent in the 2009 Lok Sabha polls, up from eight per cent in its first-ever electoral outing in the 2006 assembly polls. The DMDK contested both on its own, but lost its relevance and significance when it began aligning with other parties, especially the AIADMK. Without the patience to wait out the Dravidian majors, namely, the DMK and the AIADMK, and sans a lot of resources, no party could hope to replace either. Or, that’s the lesson of and from the DMDK for aspirants like Deepa. For now, the 10 per cent ‘wavering vote-bank’ in the state is for grabs, or so it seems -- especially after the DMDK lost it in 2016 polls and an ‘up and coming BJP’ failed to corner it. Now for Deepa to get it all, or at least some, first she has to make a dent in the local bodies elections due in April. That’s going to be a tall task as she still seems confused about her political identity and also on the advisability of tying up with the OPS camp. Neither has a registered party to call his/her own, nor an allotted election symbol. With the local polls nearly round the corner, even OPS would have to forsake his claims to the AIADMK under Sasi, if he were to obtain a separate symbol in time to popularise it among the cadres and voters. The alternative would be for the OPS camp to make a quick claim on the AIADMK and symbol, convincing the Election Commission at least to ‘freeze’ the ‘Two Leaves’ symbol, pending the final disposal of all such claims and counter-claims. In between, the local bodies polls, including municipal and municipal corporation elections, might have come and gone -- unless the judiciary is moved and in good time, for the latter to feel compelled to intervene. And unlike the symbol issue, which will rest with the Election Commission of India, the local bodies election is conducted by the State Election Commission, formed under the 74th and 75th Amendment to the Constitution, when Rajiv Gandhi was prime minister, way back in the ’80s.